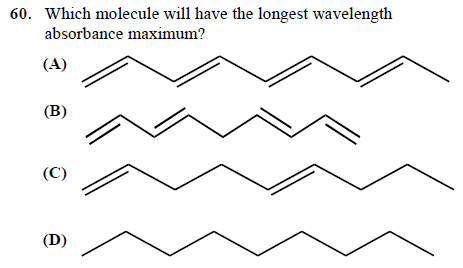 Can anyone tell me how to approach this question from USNCO 2013? The question boils down to: which molecule has the longest conjugated $\pi$-system? The answer is (A). For such a system, the particle-in-a-box model is a decent approximation and one can show that larger systems absorb at lower energies, i.e. longer wave-lengths. Not the answer you're looking for? Browse other questions tagged organic-chemistry quantum-chemistry spectroscopy or ask your own question. Why does confinement of quantum dots result in discrete energy levels? How are RDM patterns for reactions in the KEGG database constructed? How to explain the discrepancy between the calculated absorption wavelength within the particle in the box theory and the observed wavelength? What is meant by 'penetration of atomic orbitals'?